In this paper a new extension of the Lindley distribution is presented using the Weibull link function introduced and studied by Tahir et al.,1 to develop a Weibull-Lindley distribution. We derive and discuss the mathematical and Statistical properties of the subject distribution along with its reliability analysis and inference for the parameters. Finally, the Weibull-Lindley distribution has been used to model four lifetime datasets and the results show that the proposed generalization performs better than the other known extensions of the Lindley distribution considered for the study. Keywords: Lindley distribution, Weibull-Lindley distribution, mathematical properties, reliability function, parameter estimation, applications. respectively. For x>0,θ>0, MathType@MTEF@5@5@+= feaagKart1ev2aaatCvAUfeBSjuyZL2yd9gzLbvyNv2CaerbuLwBLn hiov2DGi1BTfMBaeXatLxBI9gBaerbd9wDYLwzYbItLDharqqtubsr 4rNCHbGeaGqkY=Mj0xXdbba91rFfpec8Eeeu0xXdbba9frFj0=OqFf ea0dXdd9vqai=hGuQ8kuc9pgc9q8qqaq=dir=f0=yqaiVgFr0xfr=x fr=xb9adbmqaaeaaciGaaiaabeqaamaabaabaaGcbaGaamiEaiabg6 da+iaaicdacaGGSaGaeqiUdeNaeyOpa4JaaGimaiaacYcaaaa@3F0E@ where θ MathType@MTEF@5@5@+= feaagKart1ev2aaatCvAUfeBSjuyZL2yd9gzLbvyNv2CaerbuLwBLn hiov2DGi1BTfMBaeXatLxBI9gBaerbd9wDYLwzYbItLDharqqtubsr 4rNCHbGeaGqkY=Mj0xXdbba91rFfpec8Eeeu0xXdbba9frFj0=OqFf ea0dXdd9vqai=hGuQ8kuc9pgc9q8qqaq=dir=f0=yqaiVgFr0xfr=x fr=xb9adbmqaaeaaciGaaiaabeqaamaabaabaaGcbaGaeqiUdehaaa@392D@ is the scale parameter of the Lindley distribution. Details of this distribution, its mathematical and statistical properties, estimation of its parameter and application including the superiority of Lindley distribution over exponential distribution has been done by Ghitany et al.,3 We have so many generalized families of distributions proposed by different researchers that are used in extending other distributions to produce compound distributions with better performance. These are several ways of adding one or more parameters to a distribution function which makes the resulting distribution richer and more flexible for modeling data. A brief summary of some of these methods or families of distribution include the beta generalized family (Beta-G) by Eugene et al.,4 the Kumaraswamy-G by Cordeiro et al.5 Transmuted family of distributions by Shaw et al.,6 Gamma-G (type 1) by Zografos et al.,7 McDonald-G by Alexander et al.,8 Gamma-G (type 2) by Risti et al.,9 Gamma-G (type 3) by Torabi et al.,10 Log-gamma-G by Amini et al.,9 Exponentiated T-X by Alzaghal et al.,12 Exponentiated-G (EG) by Cordeiro et al.,13 Logistic-G by Torabi et al.,14 Gamma-X by Alzaatreh et al.,15 Logistic-X by Tahir et al.,16 Weibull-X by Alzaatreh et al.,17 Weibull-G by Bourguignon et al.,18 a new Weibull-G family by Tahir et al.,1 a Lomax-G family by Cordeiro et al.,19 a new generalized Weibull-G family by Cordeiro et al.,20 and Beta Marshall-Olkin family of distributions by Alizadeh et al.,21 and some other families of the distributions. Hence, there are also some generalizations of the Lindley distribution recently proposed in the literature such as the transmuted Lindley distribution by Merovci et al.,23 the exponentiated Power Lindley distribution by Ashour et al.,24 Generalized Lindley distribution by Nadarajah et al.,24 Transmuted Generalized Lindley distribution by Elgarhy et al.,25 Extended Power Lindley distribution by Alkarni et al.,26 a two-parameter Lindley distribution by Shanker et al.,27 the Lomax-Lindley distribution by Yahaya et al.,28 Transmuted Two-Parameter Lindley distribution by Al-khazaleh et al.,29 and a three-parameter Lindley distribution by Shanker et al.,30 The aim of this article is to introduce a new continuous distribution called Weibull-Lindley distribution (WLnD) from the proposed family by Tahir et al.,1 The remaining parts of this article are presented in sections as follows: We defined the new distribution and give its plots in section 2.1. Section 2.2 derived some properties of the new distribution. Section 2.3 proposes some reliability functions of the new distribution. The order statistics for the new distribution are also given in section 2.4. The maximum likelihood estimates (MLEs) of the unknown model parameters of the new distribution are obtained in section 2.5. In section 3 we carryout application of the proposed model with others to four lifetime datasets. Lastly, in section 4, we give the summary of our work and concluding remarks. respectively, where g( x ) MathType@MTEF@5@5@+= feaagKart1ev2aaatCvAUfeBSjuyZL2yd9gzLbvyNv2CaerbuLwBLn hiov2DGi1BTfMBaeXatLxBI9gBaerbd9wDYLwzYbItLDharqqtubsr 4rNCHbGeaGqkY=Mj0xXdbba91rFfpec8Eeeu0xXdbba9frFj0=OqFf ea0dXdd9vqai=hGuQ8kuc9pgc9q8qqaq=dir=f0=yqaiVgFr0xfr=x fr=xb9adbmqaaeaaciGaaiaabeqaamaabaabaaGcbaGaam4zamaabm aabaGaamiEaaGaayjkaiaawMcaaaaa@3AE9@ and G( x ) MathType@MTEF@5@5@+= feaagKart1ev2aaatCvAUfeBSjuyZL2yd9gzLbvyNv2CaerbuLwBLn hiov2DGi1BTfMBaeXatLxBI9gBaerbd9wDYLwzYbItLDharqqtubsr 4rNCHbGeaGqkY=Mj0xXdbba91rFfpec8Eeeu0xXdbba9frFj0=OqFf ea0dXdd9vqai=hGuQ8kuc9pgc9q8qqaq=dir=f0=yqaiVgFr0xfr=x fr=xb9adbmqaaeaaciGaaiaabeqaamaabaabaaGcbaGaam4ramaabm aabaGaamiEaaGaayjkaiaawMcaaaaa@3AC9@ are the pdf and cdf of any continuous distribution to be generalized respectively and α MathType@MTEF@5@5@+= feaagKart1ev2aaatCvAUfeBSjuyZL2yd9gzLbvyNv2CaerbuLwBLn hiov2DGi1BTfMBaeXatLxBI9gBaerbd9wDYLwzYbItLDharqqtubsr 4rNCHbGeaGqkY=Mj0xXdbba91rFfpec8Eeeu0xXdbba9frFj0=OqFf ea0dXdd9vqai=hGuQ8kuc9pgc9q8qqaq=dir=f0=yqaiVgFr0xfr=x fr=xb9adbmqaaeaaciGaaiaabeqaamaabaabaaGcbaGaeqySdegaaa@3916@ and β MathType@MTEF@5@5@+= feaagKart1ev2aaatCvAUfeBSjuyZL2yd9gzLbvyNv2CaerbuLwBLn hiov2DGi1BTfMBaeXatLxBI9gBaerbd9wDYLwzYbItLDharqqtubsr 4rNCHbGeaGqkY=Mj0xXdbba91rFfpec8Eeeu0xXdbba9frFj0=OqFf ea0dXdd9vqai=hGuQ8kuc9pgc9q8qqaq=dir=f0=yqaiVgFr0xfr=x fr=xb9adbmqaaeaaciGaaiaabeqaamaabaabaaGcbaGaeqOSdigaaa@3918@ are the two additional new parameters responsible for the shape of the distribution. For x>0;θ,α,β>0 MathType@MTEF@5@5@+= feaagKart1ev2aaatCvAUfeBSjuyZL2yd9gzLbvyNv2CaerbuLwBLn hiov2DGi1BTfMBaeXatLxBI9gBaerbd9wDYLwzYbItLDharqqtubsr 4rNCHbGeaGqkY=Mj0xXdbba91rFfpec8Eeeu0xXdbba9frFj0=OqFf ea0dXdd9vqai=hGuQ8kuc9pgc9q8qqaq=dir=f0=yqaiVgFr0xfr=x fr=xb9adbmqaaeaaciGaaiaabeqaamaabaabaaGcbaGaamiEaiabg6 da+iaaicdacaGG7aGaeqiUdeNaaiilaiabeg7aHjaacYcacqaHYoGy cqGH+aGpcaaIWaaaaa@430D@ ; where θ MathType@MTEF@5@5@+= feaagKart1ev2aaatCvAUfeBSjuyZL2yd9gzLbvyNv2CaerbuLwBLn hiov2DGi1BTfMBaeXatLxBI9gBaerbd9wDYLwzYbItLDharqqtubsr 4rNCHbGeaGqkY=Mj0xXdbba91rFfpec8Eeeu0xXdbba9frFj0=OqFf ea0dXdd9vqai=hGuQ8kuc9pgc9q8qqaq=dir=f0=yqaiVgFr0xfr=x fr=xb9adbmqaaeaaciGaaiaabeqaamaabaabaaGcbaGaeqiUdehaaa@392D@ is a scale parameter and α MathType@MTEF@5@5@+= feaagKart1ev2aaatCvAUfeBSjuyZL2yd9gzLbvyNv2CaerbuLwBLn hiov2DGi1BTfMBaeXatLxBI9gBaerbd9wDYLwzYbItLDharqqtubsr 4rNCHbGeaGqkY=Mj0xXdbba91rFfpec8Eeeu0xXdbba9frFj0=OqFf ea0dXdd9vqai=hGuQ8kuc9pgc9q8qqaq=dir=f0=yqaiVgFr0xfr=x fr=xb9adbmqaaeaaciGaaiaabeqaamaabaabaaGcbaGaeqySdegaaa@3916@ and β MathType@MTEF@5@5@+= feaagKart1ev2aaatCvAUfeBSjuyZL2yd9gzLbvyNv2CaerbuLwBLn hiov2DGi1BTfMBaeXatLxBI9gBaerbd9wDYLwzYbItLDharqqtubsr 4rNCHbGeaGqkY=Mj0xXdbba91rFfpec8Eeeu0xXdbba9frFj0=OqFf ea0dXdd9vqai=hGuQ8kuc9pgc9q8qqaq=dir=f0=yqaiVgFr0xfr=x fr=xb9adbmqaaeaaciGaaiaabeqaamaabaabaaGcbaGaeqOSdigaaa@3918@ is a shape parameters of the Weibull-Lindley distribution. The following is a graphical representation of the pdf and cdf of the Weibull-Lindley distribution. Given some values of the parameters α,β&θ MathType@MTEF@5@5@+= feaagKart1ev2aaatCvAUfeBSjuyZL2yd9gzLbvyNv2CaerbuLwBLn hiov2DGi1BTfMBaeXatLxBI9gBaerbd9wDYLwzYbItLDharqqtubsr 4rNCHbGeaGqkY=Mj0xXdbba91rFfpec8Eeeu0xXdbba9frFj0=OqFf ea0dXdd9vqai=hGuQ8kuc9pgc9q8qqaq=dir=f0=yqaiVgFr0xfr=x fr=xb9adbmqaaeaaciGaaiaabeqaamaabaabaaGcbaGaeqySdeMaai ilaiabek7aIjaacAcacqaH4oqCaaa@3DC7@ , we provide some possible graphs for the pdf and the cdf of the WLnD as shown in Figure 1&2 below: Figure 1 indicates that the WLnD is a skewed distribution and can take various forms. This means that distribution can be very useful for datasets that are skewed. 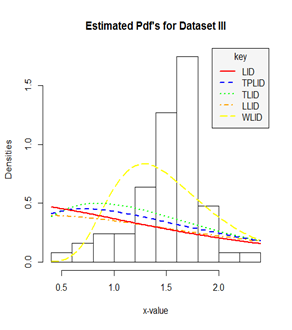 Figure 1 Graph of PDF of the WLnD for varrying parameter values. 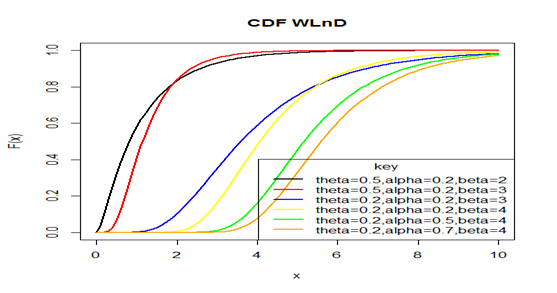 Figure 2 Graph of CDF of the WLnD for varying parameter values. From the above cdf plot, the cdf increases when X increases, and approaches 1 when X becomes large, as expected. In this section, we defined and discuss some properties of the WLnD distribution. By using (2.2.2) above, the median of X from the WLnD is simply obtained by setting u=0.5 while random numbers can be generated from WLnD by setting X=Q( u ) MathType@MTEF@5@5@+= feaagKart1ev2aaatCvAUfeBSjuyZL2yd9gzLbvyNv2CaerbuLwBLn hiov2DGi1BTfMBaeXatLxBI9gBaerbd9wDYLwzYbItLDharqqtubsr 4rNCHbGeaGqkY=Mj0xXdbba91rFfpec8Eeeu0xXdbba9frFj0=OqFf ea0dXdd9vqai=hGuQ8kuc9pgc9q8qqaq=dir=f0=yqaiVgFr0xfr=x fr=xb9adbmqaaeaaciGaaiaabeqaamaabaabaaGcbaGaamiwaiabg2 da9iaadgfadaqadaqaaiaadwhaaiaawIcacaGLPaaaaaa@3CB3@ , where u is a uniform variate on the unit interval (0,1) and W( . ) MathType@MTEF@5@5@+= feaagKart1ev2aaatCvAUfeBSjuyZL2yd9gzLbvyNv2CaerbuLwBLn hiov2DGi1BTfMBaeXatLxBI9gBaerbd9wDYLwzYbItLDharqqtubsr 4rNCHbGeaGqkY=Mj0xXdbba91rFfpec8Eeeu0xXdbba9frFj0=OqFf ea0dXdd9vqai=hGuQ8kuc9pgc9q8qqaq=dir=f0=yqaiVgFr0xfr=x fr=xb9adbmqaaeaaciGaaiaabeqaamaabaabaaGcbaGaam4vamaabm aabaGaaiOlaaGaayjkaiaawMcaaaaa@3A8E@ represents the negative branch of the Lambert function. where Q(.) is any quartile or octile of interest. Moments of a random variable are very important in distribution theory because they are used to study some of the most important features and characteristics of a random variable such as mean, variance, skewness and kurtosis. The coefficients variation, skewness and kurtosis measures can also be calculated from the non-central moments using some well-known relationships. where n and t are constants, t is a real number and μ n ' MathType@MTEF@5@5@+= feaagKart1ev2aaatCvAUfeBSjuyZL2yd9gzLbvyNv2CaerbuLwBLn hiov2DGi1BTfMBaeXatLxBI9gBaerbd9wDYLwzYbItLDharqqtubsr 4rNCHbGeaGqkY=Mj0xXdbba91rFfpec8Eeeu0xXdbba9frFj0=OqFf ea0dXdd9vqai=hGuQ8kuc9pgc9q8qqaq=dir=f0=yqaiVgFr0xfr=x fr=xb9adbmqaaeaaciGaaiaabeqaamaabaabaaGcbaacbiaeaaaaaa aaa8qacaWF8oWdamaaDaaaleaapeGaa8NBaaWdaeaapeGaa83jaaaa aaa@3AE4@ denotes the nth ordinary moment of X . 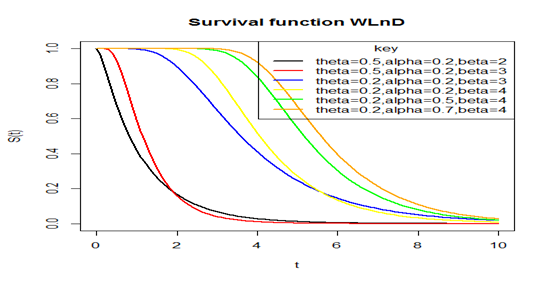 In this section, we present some reliability functions associated with WLnD including the survival and hazard functions. Below is a plot of the survival function at chosen parameter values in Figure 3. The figure above revealed that the probability of survival for any random variable following a Weibull-Lindley distribution decreases as the values of the random variable increases, that is, as time goes on, probability of life decreases. This implies that the Weibull-Lindley distribution can be used to model random variables whose survival rate decreases as their age grows. Figure 3 Plot of the survival function of the WLnD for different parameter values. The following is a plot of the hazard function at chosen parameter values in Figure 4. Figure 4 Plot of the hazard function of the WLnD for different parameter values. Figure 4 above shows the behavior of hazard function of the WLnD and it means that the probability of failure for any Weibull-Lindley random variable increases as the time or age of the variable grows or increases, that is, as time goes, the probability of failure or death increases and becomes constant after some times. where f(x) and F(x) are the pdf and cdf of the Weibull-Lindley distribution respectively. Equating equations (2.5.3), (2.5.4) and (2.5.5) to zero and solving for the solution of the non-linear system of equations will give us the maximum likelihood estimates of parameters α,β&θ MathType@MTEF@5@5@+= feaagKart1ev2aaatCvAUfeBSjuyZL2yd9gzLbvyNv2CaerbuLwBLn hiov2DGi1BTfMBaeXatLxBI9gBaerbd9wDYLwzYbItLDharqqtubsr 4rNCHbGeaGqkY=Mj0xXdbba91rFfpec8Eeeu0xXdbba9frFj0=OqFf ea0dXdd9vqai=hGuQ8kuc9pgc9q8qqaq=dir=f0=yqaiVgFr0xfr=x fr=xb9adbmqaaeaaciGaaiaabeqaamaabaabaaGcbaGaeqySdeMaai ilaiabek7aIjaacAcacqaH4oqCaaa@3DC7@ respectively. However, the above equations cannot be solved manually due to their complexity unless numerically with the help of statistically inclined computer programs like Python, R, SAS, etc., when data sets are available. This section presents four datasets, their descriptive statistics, graphics and applications to some selected extensions of the Lindley distribution including the classical Lindley distribution. We have compared the performance of the Weibull-Lindley distribution (WLlD) to some families of Lindley distribution such as Lomax-Lindley distribution (LLlD), Two-parameter Lindley distribution (TPLlD), Transmuted Lindley distribution (TLlD) and the Lindley distribution (LlD). Dataset I: This dataset represents the lifetime’s data relating to relief times (in minutes) of 20 patients receiving an analgesic and reported by Gross et al.,34 and has been used by Shanker et al.,35 Table 1. Dataset II: This data represent the survival times in weeks for male rats Lawless et al.,36 (Table 2). Data set III: This data set represents the strength of 1.5cm glass fibers initially collected by members of staff at the UK national laboratory. It has been used by Bourguignon et al.,18 Afify et al.,37 Barreto Souza et al.,38 Oguntunde et al.,39 Ieren et al.,40 as well as Smith et al.,41 Its summary is given as follows: (Table 3). We also provide some histograms and densities for the three data sets as shown in Figure 5–8 below respectively (Table 4). From the summary statistics of the four data sets, we found that data sets I and IV are positively skewed, while II is a bit negatively skewed or approximately normal and III is negatively skewed. Also, data sets I, III and IV have higher kurtosis while II have low level or degree of peakness. Figure 5 Histogram and density plot for the Relief times of 20 patients (Data set I). Figure 6 Histogram and density plot for the survival times in weeks for male rats (Data set II). Figure 7 A histogram and density plot for the strength of 1.5cm glass fibres (Data set III). Figure 8 A histogram and density plot for the monthly actual taxes revenue in Egypt (Data set IV). These four different datasets presented above were used to fit all the above listed Lindley distributions by applying the formulas of the test statistics in section 2 in order to get the best fitted model and the results are presented as follow in the four tables for each dataset below: (Table 5). From Table 5, the values of the parameter MLEs and the corresponding values of ƖƖ, AIC, A*, W* and K-S for each model show that the Weibull-Lindley distribution (WLlD) has better performance compared to the other four models namely: Lomax-Lindley distribution (LLlD), Two-parameter Lindley distribution (TPLlD), Transmuted Lindley distribution (TLlD) and the Lindley distribution (LlD) and hence becomes the best fitted distribution based the data set I (Table 6). 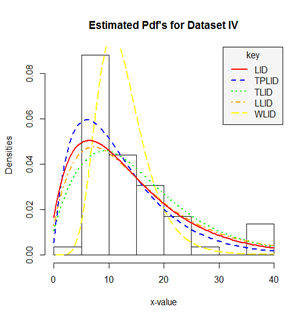 Again the results in Table 6 above shows that the Weibull-Lindley distribution (WLlD) fits the second dataset better than the other four models (LLlD, TPLlD, TLlD and LlD) because the values of the statistics; AIC, A*, W* and K-S are smaller for the WLlD than the other models and therefore it is considered as the best fitted distribution based the data set II (Table 7). The results from Table 7 also agrees with the previous results that the WLlD is more flexible compared to the three other models this also agrees with the fact that generalizing any continuous distribution provides a compound distribution with at least better fit than the classical distribution (i.e Lindley) irrespective of the nature of the data used provide it is asymmetry Table 8. Lastly, our results in Table 8 provides the same results as obtained in the above previous tables with the Weibull-Lindley distribution performing better than the other three distributions considered in this study. The following figures displayed the histogram and estimated densities of the fitted models for the four real life data sets used in this study. 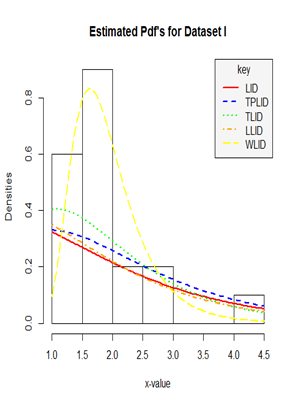 From the estimated density plots in Figures 9 we can observe that though there is no big difference between the performance of the other four models, it is very clear that the performance of the Weibull-Lindley distribution (WLlD) remains the best and consistent irrespective of the nature the datasets as compared to the Lomax-Lindley distribution (LLlD), Two-parameter Lindley distribution (TPLlD), Transmuted Lindley distribution (TLlD) and the Lindley distribution (LlD). 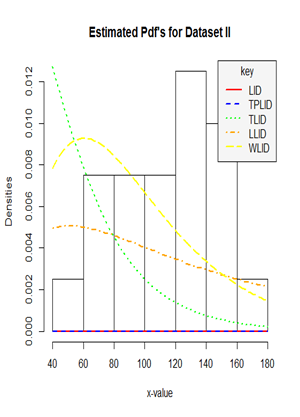 Figure 9 Histogram and estimated densities of the Weibull-Lindley distribution (WLlD), Lomax-Lindley distribution (LLlD), Two-parameter Lindley distribution (TPLlD), Transmuted Lindley distribution (TLlD) and the Lindley distribution (LlD) for the four real life datasets (dataset I, II, III and IV). Furthermore, the performance of the Weibull-Lindley could be attributed to the fact that the Weibull-Lindley distribution is heavy-tailed and highly skewed to the right with excellent flexibility which allows it to take various shapes depending on the parameter values and it also exhibit some degree of kurtosis all of which are features of the four datasets used in this research, hence, the Weibull-Lindley distribution will be more appropriate for lifetime datasets which are positively skewed with a higher degree of peakness as well as those that are approximately normal with observations above zero. Hence, having demonstrated earlier in Tables 5–8, we have a similar conclusion based on figure 3-5 that the Weibull-Lindley distribution has a better fit for the four data sets considered in this study. This article proposed a new distribution called Weibull-Lindley distribution. The Mathematical and Statistical properties of the new distribution have been derived and studied extensively. Some of its properties with graphical analysis and discussion on their usefulness and applications were also considered. The model parameters were estimated using maximum likelihood method and we have a conclusion based on our applications of the model to four real life datasets that the new distribution (WLnD) has a better fit compared to the other four already existing models considered in this study. Tahir MH, Zubair M, Mansoor M, et al. A new Weibull–G family of distributions. Hacettepe Journal of Mathematics and Statistics. 2016;45(2):629–647. Lindley DV. Fiducial distributions and Bayes' theorem. Journal Royal Statistical Society Series B. 1958;20:102–107. Ghitany ME, Atieh B, Nadarajah S. Lindley distribution and its applications. Mathematical Computation and Simulation. 2008;78(4):493–506. Eugene N, Lee C, Famoye F. Beta–Normal Distribution and It Applications. Communication in Statistics: Theory and Methods. 2002;31:497–512. Cordeiro GM, De Castro M. A New Family of Generalized Distributions. Journal Statistical Computation and Simulation. 2001;81:883–898. Shaw WT, Buckley IR. The alchemy of probability distributions: beyond Gram–Charlier expansions and a skew–kurtotic–normal distribution from a rank transmutation map. Research report. 2007. Zografos K, Balakrishnan N. On families of beta–and generalized gamma generated distributions and associated inference. Statistical Methods. 2009;63:344–362. Alexander C, Cordeiro GM, Ortega EMM, et al. Generalized beta–generated distributions. Computational Statistics and Data Analysis. 2012;56:1880–1897. Ristic MM, Balakrishnan N. The gamma–exponentiated exponential distribution. Journal Statistics Computation and Simulation. 2012;82:1191–1206. Amini M, Mirmostafaee SMTK, Ahmadi J. Log–gamma–generated families of distributions. Statistics. 2014;48(4):913–932. Alzaghal A, Lee C, Famoye F. Exponentiated T–X family of distributions with some applications. International Journal Probability and Statistics. 2013;2:31–49. Cordeiro GM, Ortega EMM, Da Cunha DCC. The exponentiated generalized class of distribution. Journal of Data Science. 2013;11:1–27. Torabi H, Montazari NH. The logistic–uniform distribution and its application. Communications Statistics: Simulation and Computation. 2014;43:2551–2569. Alzaatreh A, Famoye F, Lee C. The gamma–normal distribution: Properties and applications. Computational Statistics and Data Analysis. 2014;69:67–80. Tahir MH, Cordeiro GM, Alzaatreh A, et al. The logistic–X family of distributions and its applications. Communication in Statistics: Theory and Methods. 2016;45(24):7326–7349. Alzaatreh A, Famoye F, Lee C. Weibull–Pareto distribution and its applications. Communication in Statistics: Theory and Methods. 2013;42:1673–1691. Bourguignon M, Silva RB, Cordeiro GM. The Weibull–G Family of Probability distributions. Journal Data Science. 2014;12: 53–68. Cordeiro GM, Ortega EMM, Popovic BV, et al. The Lomax generator of distributions: Properties, minification process and regression model. Applied Mathematics and Computation. 2014;247:465–486. Cordeiro GM, Ortega EMM, Ramires TG. A new generalized Weibull family of distributions: Mathematical properties and applications. Journal Statistical Distributionand Applications. 2015;2(13):13. Alizadeh M, Cordeiro GM, De Brito E, et al. The beta Marshall–Olkin family of distributions. Journal of Statistical Distribution Application. 2015;2(4):1–18. Merovci C. Transmuted Lindley distribution. International Journal of Open Problems in Computational Mathematics. 2003;6(2):63–74. Ashour SK, Eltehiwy MA. Exponentiated power Lindley distribution. Journal of Advanced Research. 2005;6:895–905. Nadarajah S, Bakouch HS, Tahmasbi R. A generalized Lindley distribution. Sankhya B. 2015;73:331–359. Elgarhy M, M.Rashed M, Shawki AW. Transmuted Generalized Lindley Distribution. International Journal of Mathematics Trends and Technology. 2016;29(2):145–154. Alkarni SH. Extended Power Lindley Distribution: A New Statistical Model For Non–Monotone Survival Data. European Journal of Statistics and Probability. 2015;3(3):19–34. Shanker R, Kamlesh KK, Fesshaye H. A Two Parameter Lindley Distribution: Its Properties and Applications. Biostatistics and Biometrics Open Access Journal. 2017;1(4):555570. Yahaya A, Lawal A. A study on Lomax–Lindley distribution with applications to simulated and real life data. Nigeria: University of Calabar, Calabar; 2018. Shanker R, Shukla KK, Shanker R, et al. A Three–Parameter Lindley Distribution. American Journal of Mathematics and Statistics. 2017;7(1):15–26. Hyndman RJ, Fan Y. Sample quantiles in statistical packages. The American Statistics. 1996;50(4):361–365. Kenney JF, Keeping ES. Mathematics of Statistics. 3rd New Jersey: Chapman & Hall Ltd. 1962. Moors JJ. A quantile alternative for kurtosis. Journal of the Royal Statistical Society. 1988;37:25–32. Gross AJ, Clark VA. Survival distributions reliability applications in the Biometrical Sciences. New York: John Wiley; 1975. Shanker R, Fesshaye H, Sharma S. On two–Parameter Lindley distribution and its applications to model lifetime data. Biom Biostat Int J. 2016;3(1):00056. Lawless JF. Statistical Models and Methods for Lifetime Data. 2nd New Jersey: Wiley; 2003. Afify AZ, Aryal G. The Kummaraswamy exponentiated Frechet distribution. Journal of Data Science. 2016;6:1–19. Oguntunde PE, Balogun OS, Okagbue HI, et al. The Weibull–Exponential Distribution: Its Properties and Applications. Journal of Applied Science. 2015;15(11):1305–1311. Ieren TG, Yahaya A. The Weimal Distribution: its properties and applications. Journal of the Nigeria Association of Mathematical Physics. 2017;39:135–148. Smith RL, Naylor JC. A Comparison of Maximum Likelihood and Bayesian Estimators for the Three–Parameter Weibull Distribution. Journal of Applied Statistics. 1987;36:358–369. Owoloko EA, Oguntunde PE, Adejumo AO. Performance rating of the transmuted exponential distribution: an analytical approach. Springer plus. 2015;4:818. ©2018 Ieren et al. This is an open access article distributed under the terms of the Creative Commons Attribution License , which permits unrestricted use, distribution, and build upon your work non-commercially.